AnyToISO Lite is the free version of AnyToISO Converter. AnyToISO Lite could convert all types of CD/DVD image to ISO image, such as *.bin, *.cdi, *.mdf, *.mdx, *.b6i, *.b5i, *.nrg, *.pdi, *.gbi, *.daa, *.uif, *.dmg, *.iso, *.isz, *.deb, *.rpm, *.ima, *.img, *.zip, *.imz or *.rar files. 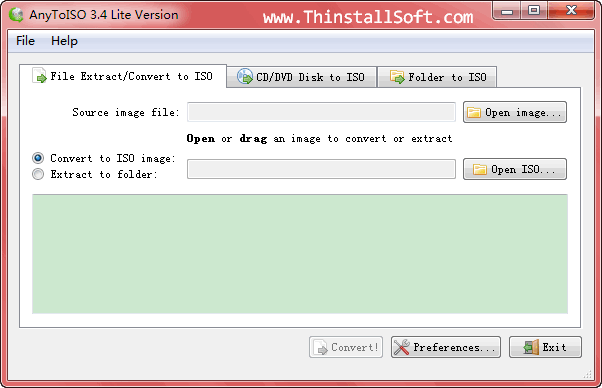 AnyToISO Lite can also convert CD/DVD disk to ISO or BIN/CUE image directly. In addition, it could easily make ISO with 3 file system (ISO 9660, Joliet and UDF) from a folder on your computer. AnyToISO Lite is also an ISO Extractor to extract files from all types of disk images. Run AnyToISOPortable.exe to launch AnyToISO Portable. You could have a try on other good ISO converters such as ISO Workshop, Free ISO Creator, ISOBuddy, IMG to ISO, etc. What's new in AnyToISO Lite 3.7.4? This entry was posted in DVD & Blu-ray and tagged any to iso, AnyToISO, bin to iso, ccd to iso, daa to iso, dmg to iso, dvd to iso, folder to iso, ima to iso, img to iso, img2iso, iso converter, iso creator, iso extractor, iso maker, isz to iso, mdf extractor, mdf to iso, ngr to iso, rar to iso, rpm to iso, uif to iso, zip to iso. Bookmark the permalink.